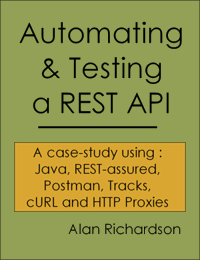 This 200+ page e-book documents a case study of testing and automating a REST API based application. It covers interactive testing of the application through the GUI, and via cURL and HTTP Proxies. And automating with Java and REST-assured. Comprehensively documented, with full source code available, you're sure to learn something new. This is the support page for the book with links to the source, tools and the free supporting videos mentioned in the text. Tracks is an open source application written in Ruby on Rails which implements the David Allen "Getting Things Done" time management methodology. There is a video below showing how to install and use the source code. I created supporting videos for some of the chapters and sections in the book. These make most sense when read in conjunction with the book but offer a visual insight into tools used which the book can't cover quite as well. This is easy to install using Docker and this video shows the process in action. Then visit localhost:80, create an admin account. Installing Tracks to a VM using Turnkey. added an introduction chapter "Introduction to APIs" on various web terminology - what is HTTP, what is an API, what is REST, what are HTTP headers, etc. expanded text in "Exploring The Tracks API with cURL through a Proxy"
added more explanatory notes in the cURL chapter "Case Study Example Using cURL on Tracks"
added a new chapter providing an overview of the Tracks 2.3.0 testing before diving into the details "The Case Study Overview - Testing Tracks v 2.3.0"
added A new chapter, with a new package in the code, covering JSON and XML processing with REST Assured "REST Assured JSON and XML Processing"
Paperback edition currently in proof creation and review mode. Will be the same as the 2017/07/03 release. On 4th August 2017 I was told that Bitnami had discontinued the Tracks VM and self contained install. This is unfortunate as I found it the most reliable and easiest way of getting started. Turnkey is now the simplest way of getting started. I emailed Bitnami, just in case they could reinstate the installs but on 8th August I learned that the installs would not be reinstated. I suspect the following links will forever remain 'discontinued'. You should probably use Turnkey Tracks installers and VMs (but see the additional information below). You can still use Bitnami VMs but you have to install Tracks yourself. The following instructions are the steps I took to install Tracks into the Bitnami Ruby Infrastructure VM. The option of using Turnkey is available, with a minor, but quite annoying issue in Tracks UI. This issue is with missing icons in Tracks from Turnkey. For example, the start and the edit icons are missing for existing actions in a project (you can see the missing resources error in a browser dev console). You need to run this in Linux command line (or SSH) on the VM. Then, after restarting my virtual machine, I have got the icons after login into Tracks. Hope this helps, in case other students will face a similar issue. Last modified:February 25 2019 13:44:30.